One night last week, I celebrated my birthday at the Volks Tavern, a small club on the colonnade at Madeira Drive, near Brighton Pier. It is named after the light railway that runs nearby, and is one of the most laidback, intimate venues in the city. One of my oldest friends, Stephen Silverwood, founded Refugee Radio in 2008. I’ve listened to a few of their weekly broadcasts on the local and online Brighton station, Radio Reverb, interviewing refugees and asylum seekers living in the area. What struck me, while listening to the early shows, was how much more diverse are the stories of so-called ‘ordinary people’ than those of celebrities that the mainstream media tends to focus on. It’s often said that there aren’t enough positive role models in public life, and perhaps this is because some of the people we can most readily identify with and learn from are not necessarily rich or famous, but living within our own communities. Refugee Radio’s expressed aim is to ‘give a voice to those who do not have one, through media, communications and social events.’ Service users have been able to attend radio workshops, as well as performing at roadshows with their own bands, or as part of a growing orchestra. Support was provided by The Cornerstones, a semi-acoustic, Burundi-influenced band whose repertoire includes the lovely ‘She’s Gone Back to Her Roots’. 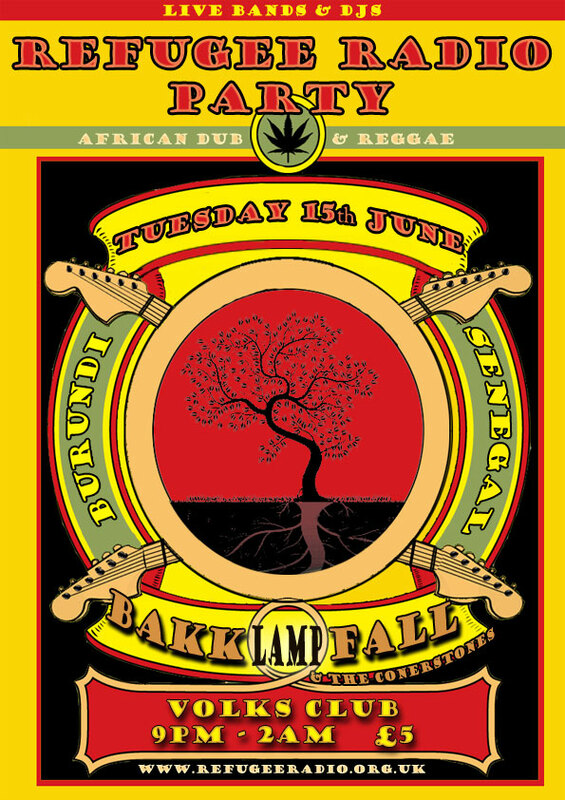 Headliners Bakk Lamp Fall are a Senegalese fusion collective, with a driven, hypnotic sound. Meanwhile, DJs from Radio Reverb and the Refugee Radio Orchestra played sets in the basement. Last week I was lucky enough to see Refugee Radio take a step in the right direction, and with more ambitious projects to come – a documentary currently being filmed, and hopes for a record label – the future looks bright.